The German Peer Klüßendorf, who has been debating for Lund University for the last two years and won the European Championship 2013, went to the second French World Debating Championship in Paris. In this week’s Mittwochs-Feature, he summarises his experiences and writes about different debating formats, French humour, and a Grand Final judging panel that refused to announce the winner before an encore with reversed roles. A suavely suited up young man walks on stage. With his loud voice he fills the historic auditorium easily. He raises a sword. 30 seconds later, he is sitting on the President’s chair, still speaking, and banging his head on a table. We are, obviously, at a debate competition. It is in France however, where things are a bit different, as this scene from the public speaking contest shows. The three finalists of the public speaking contest received the subject of their short discourses, a sword that was brought ceremoniously into the auditorium, a mere thirty seconds before their speeches. The winner, Adam Samson from Canada, successfully argued for the object’s non-existence. The audience is comprised of over 40 teams and many judges from more than a dozen countries all around the world. Among others, debaters from Canada, Morocco, Senegal, Australia, and also Germany are present. For a week in May, I was among over one hundred students who gathered in Paris for the second edition of the French speaking World Championship, organised by the Fédération Francophone de Débat (FFD). The debate format looks similar to British Parliamentary Style, with four teams of two speakers competing in the preliminary rounds with seven minute speeches for a chance to speak at the Grand Final in front of a jury consisting of known professors, lawyers and a former minister of the Sarkozy government. But the French would not be the French, if they had simply copied the British format. For starters, the two government and opposition teams are supposed to form a truly cooperating side. In one hour preparation time, free choice of speaker positions and a limit to one argument per speaker, the format encourages exchange. It also makes preparation time confusing, as you are constantly pushed to share your arguments with teams you are directly competing against. The scoring system mitigates these effects, since apart from the final, winning a debate is hardly relevant. It is much more important to receive a high speaker score, which is defined through an elaborate scoring sheet, similar to the German OPD format. 40% of the points are, without subcategories, given for style and 60% for various criteria linked to content, including 5% for outlining and 20% for asking and answering POI’s. If they scored high enough, all four teams of one quarter final could advance, with no teams advancing from another. This results in raised voices, vivid facial expressions, and minutes of preparation time spent on fine-tuning that one corny wordplay. Most speeches are captivating, even if they sometimes lack consistency and depth of argumentation. The differences between the formats and debate philosophies become particularly apparent in debates with teams of French as a Second Language (FSL). The differing strengths nevertheless lead to quite balanced debates, with some FSL teams just barely missing the Open break. 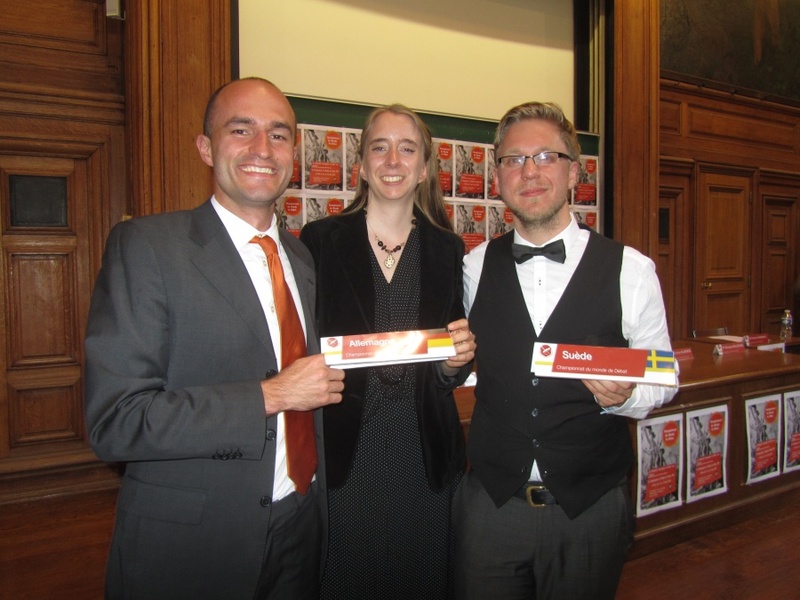 The FSL final consisted of students from Science Po Paris, Germany (Reinhold Koch and Stefanie Westermeier, Munich), Australia and Sweden. In a debate on the reintroduction of military service, my Swedish team (without Swedes), together with Louise Lawson, convinced the judges by appealing to the “Valeur Républicain” of a common service. I also managed to win the Best Speaker award. In the Grand Final, teams from Canada, France, and Switzerland debated whether the supremacy of the English language should be fought. After a heated debate, the jury convened a long time, refused to announce a winner and rather improvised a new modus to determine the Champions: They challenged their two favourite teams to repeat a debate with shortened speeches – and reversed positions. Ultimately victorious were two students from Switzerland, Brian Favre and Aline Fuchs. Best speaker is Elisabeth Arsenault. The French World Championship is still in its infancy, and people older than me are free to draw parallels to how English Language Debating became global. With some of its quirks, it is a very lively scene, held together by very motivated organisers around Romain Decharne and Antoine Chadanian, President and Vice-President of the FFD. In these still evolving structures, there is much room for humour, improvisation and a Bourdieusian little breaking of rules by the “cultural elite”. Debaters of Europe, it’s time to take out your highschool French grammar books and prepare for next year’s edition of what promises to become a great institution in university debating. 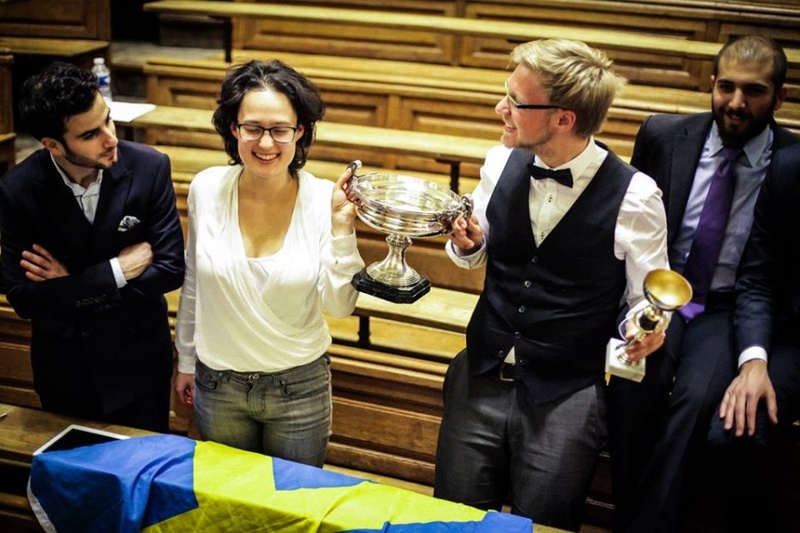 Peer Klüßendorf is European Champion and Worlds finalist in University Debating in English as a Second Language. He also was the best speaker at the final of the German Debating Championship. He is the former Vice-President of Lund Debate Society and currently finishes his M.Sc. in Environmental Studies and Sustainability Science at Lund University. The Mittwochs-Feature: every Wednesday at 10 am, the “Wednesday Feature” introduces an idea, a debate, a book or a person. If you want to kick off a debate, send us your proposal via email at team [at] achteminute [dot] de.